Haydn, Joseph, Complete Sonatas and for Solo Piano, Vols. I and II, Dover Edition. Beethoven, L.V., Complete Piano Sonatas, Vol. I, Kalmus Edition. TA will give out specific assignments in the first week of class. Hindemith, Paul, Elementary Training for Musicians. Rhythmic drills will come out of this book. Mozart, W.A., Cosi Fan Tutte, Piano-Vocal Score, G. Schirmer Inc.
Monday, March 31: Review of chorales and Haydn analysis paper from the Winter Quarter. T, Apr. 1: Review of diatonic cadential progressions. W, Apr. 2: Review of eighth-note motion in chorale settings. M, Apr. 7: Review of altered chords. Read "Pre-Dominant Harmonies" PP, 1-4 in Course Reader. Variations technique in Haydn and Beethoven. T, Apr. 8: SS drill. Score Reading: prepare violin/viola duet from P. 21 of the Course Reader. W, Apr. 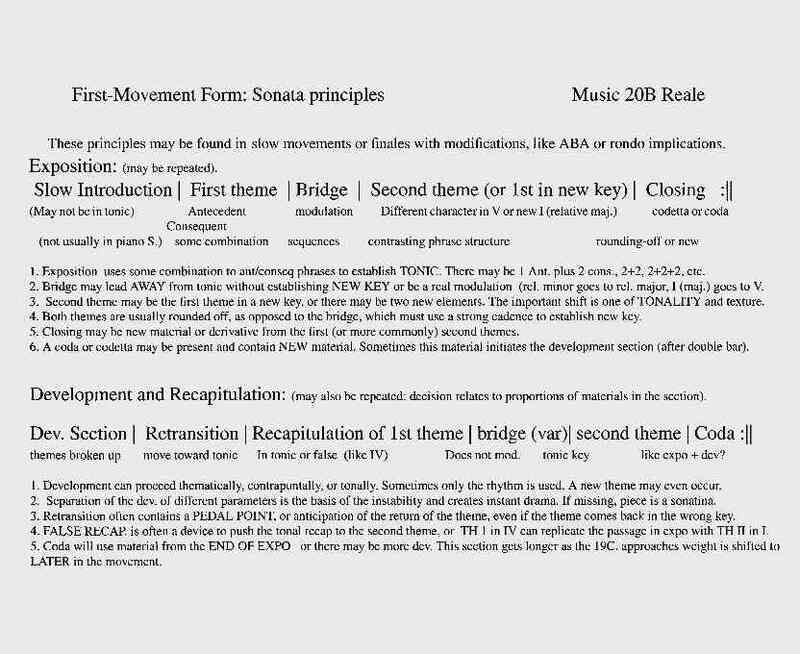 9: Begin expansion of sonata principles. Third-related harmonies: Read "Modal Alterations," pp.6-11 in Course Reader. Th, Apr. 10: open score. Score Reading: prepare #8, P. 22 in the Course Reader. M, Apr. 14: begin third-related harmonies. T, Apr. 15: drill augmented sixth chords. KB Harmony Assignment #1 from Course Reader, P. 20 should be prepared. W, Apr. 16: Dictation drill. Score Reading: prepare #38, P. 23 in the Course Reader. T, Apr. 22: augmented sixth chords as enharmonic secondary dominants. KB Harmony Assignment #2 from Course Reader, P. 20 should be prepared. W, Apr. 23: Further development after recapitulation. M, Apr. 28: Written Midterm Exam in analysis. T, Apr. 29: Midterm in Dictation. W, Apr. 30: Musicianship midterm (individual appointments). SS, prepare from Mozart's Cosi Fan Tutte, PP. 11-16 for performance in class. Score Reading: prepare #19, P. 24 from the Course reader. M, May 5: the concept of the recapitulation of different parameters at different times. T, May 6: harmonizing melodies. W, May 7: global vs. local tonal operations I.
Th, May 8: TA's choice (assignment made in previous class from Cosi. M, May 12: global vs. local operations II. T, May 13: continue harmonizing melodies. Score Reading: prepare transposing EH melody from Course Reader, P. 25. W, May 14: Dictation drill. Th, May 15: TA's choice (keyboard and SS). M, May 19: Slow movement synthesis. T, May 20: TA's choice for SS , plus Cosi, PP. 41-52 in class..
KB Harmony assignment #3 from Course Reader should be prepared. W, May 21: Beethoven and counterpoint. Th, May 23: Let's fake and opera. M, May 26: Memorial Day. T, May 27: discuss sequences (Brings PP. 52-57). W, May 28: Minuets and Scherzos. Th, May 29: TA's choice for keyboard harmony. M, June 2: Beethoven and Romanticism. T, June 3: TA's choice (keyboard harmony and opera). Score Reading: prepare #47 on P. 27 of Course reader. W, June 4: Review of chromatic harmony. Th, June5: Review of musicianship skills. Students may seek help from the professor at the office hour, Wednesday 12:00-1:00 PM, by e-mail (p_reale@minotaurz.com), or by phone (dedicated line available until 8PM). In advance of due date, assignments may be faxed for approval. Harmony assignments (3) involve four-part writing in Bach-Chorale style. Analysis papers Nos. 1 and 2 will involve music of Beethoven.